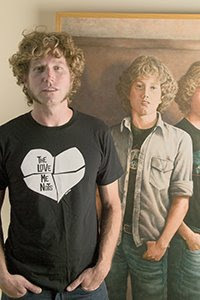 Some 25 years after his mother painted him as twins Garrett Immel is pictured in a reminiscent pose. A musician, make-up artist, guitar maker and all round good guy he makes his folks mighty proud. I love this. I haven't seen your brother for many years. I am trying to contact him here is my email....help!